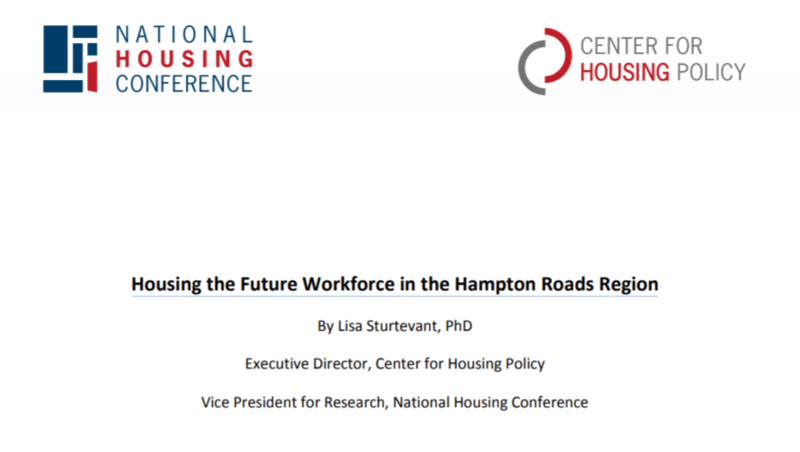 A vibrant and sustainable regional economy depends on the availability of a sufficient supply of housing—of the right types and prices and in the right locations—to accommodate the future workforce in Hampton Roads. Housing, along with transportation investments and development of a skilled labor force, needs to be a key element of a successful regional economic development strategy. Housing and transportation, in particular, are two sides of the same coin and provide the critical means by which workers are connected to jobs. There will never be enough resources to fund all the transportation and transit projects envisioned for the region to connect its residents to its employment centers. But making decisions at the local level to increase the supply of housing close to jobs can achieve the goals of linking workers with jobs, and at substantially lower public cost. The changing structure of the Hampton Roads economy will lead to changing housing needs in the region. The ability for Hampton Roads to remain competitive during this period of economic restructuring will depend on both a comprehensive regional housing strategy and local housing and land use policy decisions that promote housing development.